Back on Sept. 6, 2012 I wrote a Blog entry, Smithsonian-Affiliated "National Atomic Testing Museum" Promises UFO "Secrets" Revealed. It is still getting a lot of web hits - currently it's my third most-viewed entry, in spite of being a year and a half old. One would hope that in that intervening time things would have gotten better, owing to the bad publicity they received over this. Unfortunately, things seem to be getting worse. During the question and answer session, Las Vegas skeptic John Whiteside asked about the supposed “authentic alien artifact” in the Area 51 exhibit. The moderator referred the question to reporter George Knapp, in the audience, who (scandalously) was the source of that “artifact.” Knapp has made a career out of reporting on weird stuff like alleged saucers at Area 51, Robert Bigelow’s Haunted Ranch in Utah, etc. Who had verified that supposed artifact? The Russians, and others. Who exactly? No answer. The table of the National Atomic Testing and UFO Museum, at the 2014 International UFO Congress. 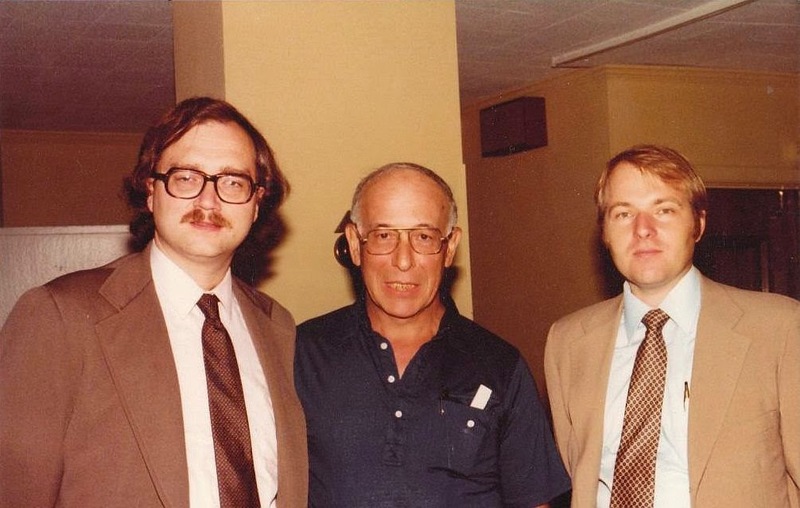 Allan Palmer (right), with Lee Speigel of the Huffington Post. At the conference, I had the opportunity to meet the Executive Director and CEO of the museum, Allan Palmer. He is a personable sort of fellow, and, I thought, much more of a showman than an educator. (Earlier, when he was the head of the San Diego Air and Space Museum, he brought in the exhibit The Science of Aliens.) I thought that he perhaps might be upset concerning what I had written earlier about his museum, but that did not seem to be the case at all. It's "write anything you want, as long as you spell my name correctly," I suppose. As we discussed that controversial panel of pro-UFOlogists who presented dubious UFO claims at his museum (see my earlier Blog posting), Palmer explained the difficulties he had with the Smithsonian over his museum's use of the tag "Smithsonian-affiliated." They didn't like his use of that label when the subject matter is UFOs. But, he replied to them, you have presented a program on UFOs yourself! And he reminded them that on Sept. 6, 1980 the Smithsonian Institution sponsored a half-day UFO Symposium in Washington, DC. In November of last year, I received email from Lee Speigel, who writes Weird News for the Huffington Post. He said he was going to be giving a talk at the National Atomic Testing and UFO Museum the following month, and wanted to know if I had any photos or other information about the Smithsonian UFO Panel. (Speigel attended that panel, which is where I first met him.) I replied by sending him the picture you see below, the only one from the event I currently have, plus the link to my presentation. (UFO and Bigfoot skeptic). Photo by John Timmerman. Armed with that information, Palmer apparently went back to the folks at the Smithsonian, and filled them in on their own forgotten chapter about UFOs. After which, he said, they told him 'do anything you want, just don't put our name on it.' 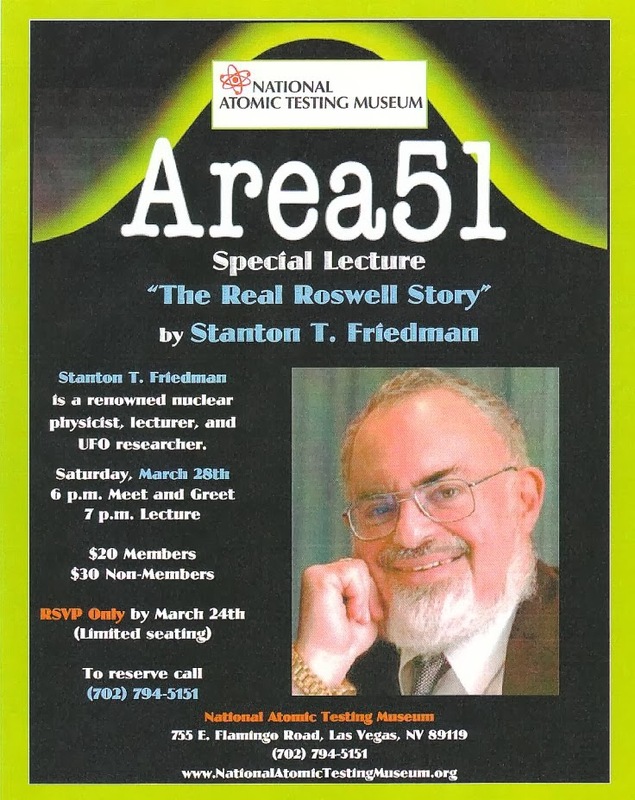 So you will notice that, on the flier for the talk to be given at the Museum by Stanton T. Friedman, the "Flying Saucer Physicist," the words "Smithsonian-affiliated" do not appear. A small victory, I suppose. Very small. The Museum is now sponsoring a talk by The Flying Saucer Physicist himself. I was interested to see in the March/April, 2014 issue of the Skeptical Inquirer, a short News and Comment piece, "Pseudoscience Creep: Science Museums, Universities Host Pseudoscience" by Jessie Haynes. In it, she notes how in 2005, the Smithsonian Institution hosted the screening of an anti-evolution film by the Discovery Institute, in return for a $16,000 contribution from that organization. She also notes other dubious presentations by museums and schools, concluding "Pseudoscience is rampant in museums and schools across the United States, and unfortunately the media and likewise the public don't seem to care." A coupon for discount admission to the Area 51 Exhibit, for UFO Congress attendees only. Here’s the MAJESTIC-12 language attributed to “Chapter 5: Extraterrestrial Biological Entities” of the Group Special Operations Manual dated April 1954, reformatted on this show to fabricate a “1 March 1954” memo, by computer, in Times New Roman. I quote from Stanton Friedman’s Top Secret/Majic, an unimpeachably pro-UFO source: “Any encounter with entities known to be of extraterrestrial origin is to be considered to be a matter of national security and therefore classified TOP SECRET. Under no circumstances is the general public or public press to learn of the existence of these entities. The official government policy is that such creatures do not exist, and that no agency of the federal government is not engaged in any study of extraterrestrials or their artifacts. Any deviation from this sated policy is absolutely forbidden.” This is the same text Hangar 1 uses, but they excerpt only some sentences from the MJ-12 manual in crafting their own fake memo. 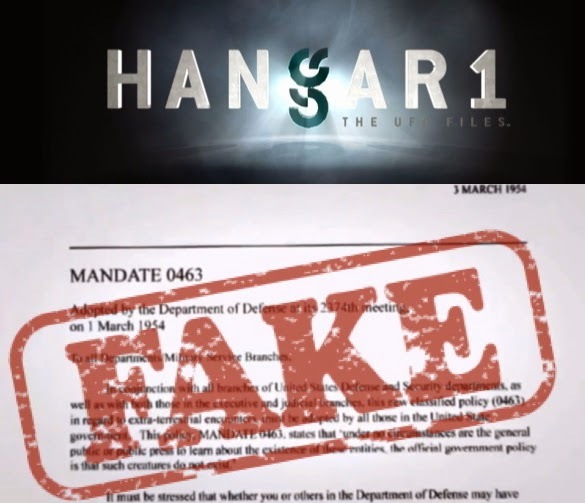 The whole thing we see on screen appears to be a complete fabrication from this passage of the fictional MJ-12 documents, and no one on this show acknowledges or addresses the deception involved in creating this fake document as an “illustration.” I’m sure as far as the show is concerned, it’s just another “reconstruction” like reenactments featured during the show, but they present it as though it were true, quote from the fake document as real, and give a fake date not supported by the “actual” files in the MUFON archive. Read that carefully: MUFON has fabricated documents to look like genuine secret government UFO documents, and presented them in Hangar 1 as if they were authentic, with no explanation or disclaimer. If that isn't downright dishonesty, I don't know what else to call it. In a sense this is nothing new. When the notorious Gulf Breeze UFO hoax photos first surfaced in 1987, MUFON's director Walt Andrus embraced them wholeheartedly, resulting in the resignation of some of MUFON's best-known investigators. Andrus was so protective of that hoax that when some of MUFON's most respected investigators checked it out it first-hand and declared it a hoax, Andrus' reaction was to fire the investigators, and keep the hoax (see my book Psychic Vibrations, p. 60, also see "Gulf Breeze" in index). And the reason was obvious: these dramatic but hokey photos were enormously popular with MUFON's subscribers, who wanted to see more "red meat" in UFOlogy. And propelled by the momentum of the Gulf Breeze hoax, MUFON grew significantly. Unfortunately, given the success of such trashy cable TV shows like Ancient Aliens, Hangar 1 probably will be a commercial success. It gives viewers what they want - exciting stories about alien encounters that sound credible because they are presented in an extremely biased and inaccurate way. And it probably will be successful in bringing new members to MUFON, who will demand more UFOlogical "read meat" lest their attention wander. So look for plenty more such absurdities to follow. Such is the dynamic at work in "Retail UFOlogy": Numerous, uncritical followers gather around a person or organization that gives them the UFOlogical "red meat" that they crave. (See, for example, Steven Greer, or Whitley Strieber.) More cautious organizations, for example, MUFON under James Carrion, do not excite and retain their followers nearly as well, and tend to lose membership. They don't want to hear about caveats and uncertainty. But when the organization follows the spotlight and ignores proper skepticism, it defines itself as fringe, "crackpot" organizations, and is laughed at by anyone who understands science. 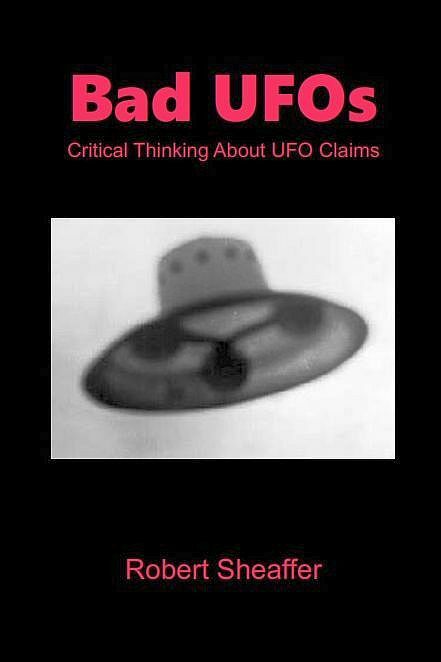 What is really interesting is that the people who seem to be the most upset about the absurdities of Hangar 1 are not skeptics, who expect pro-UFO organizations to act irresponsibly, but instead the group I call skeptical believers: those who believe that some UFO incidents might represent genuine mysteries beyond science, but who recognize that the great bulk of UFOlogy consists of error, exaggeration, and humbug. And the "skeptical believer" is just as ready to denounce humbug as is any skeptic. After all, the only way to convince science that the UFO phenomenon is worth studying would be to toss aside all of the accumulated humbug, and accentuate the (hopefully) solid cases. So when MUFON gives itself over to humbug without reservation, it destroys all hope of presenting a convincing pro-UFO case to the skeptical scientific world. So much for the "scientific method!" In a very real sense, the skeptical believers, along with skeptics, are allies who can be characterized as realists - those who care very much what the facts are about UFO cases and try to stick to the facts as best possible - as opposed to unrealists who are ready to embrace any absurd UFO tale if it is exciting, and ignore all facts to the contrary. 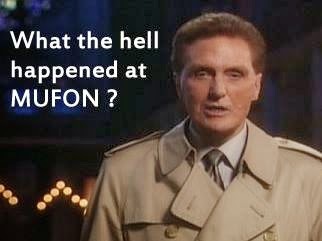 There are still some fine investigators in MUFON, who do not make claims beyond what the data will allow, and who are ready to denounce hoaxes and humbug wherever encountered. People like these cannot possibly be happy about MUFON's plunge into tabloid sensationalism, and can scarcely afford to have their names associated with such trash. And finally, we learn from John Ventre, a MUFON state director and one of the "stars" of Hangar 1, that the missing Malaysia Airlines Flight 370 was abducted by extraterrestrials. What is MUFON coming to?